Chinese handset maker, Huawei recently announced that it will participate at the upcoming Mobile World Congress in Barcelona, Spain. It’s being speculated that the brand might launch the upcoming P30 series smartphones at the event. The P30 and P30 Pro have both been subjected to a number of leaks in the past. 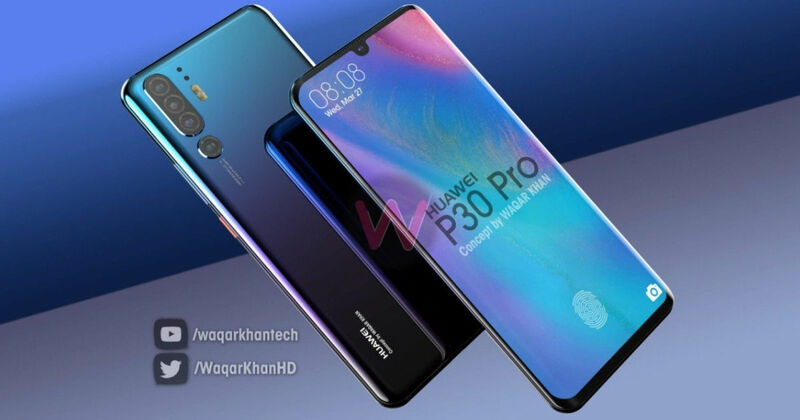 Now, Youtuber Waqar Khan has developed the concept render of the Huawei P30 Pro. The new concept renders of the smartphone give us a fair idea of what to expect in terms of the design and is in line with what we have already seen in the previous leaks. We can see that the handset will come flaunting a glass-sandwich design with narrow bezels on the sides and a very thin chin. Moreover, the display is seen sporting a waterdrop notch and seems to be curving on the sides like the recently launched Mate 20 Pro (review). The renders also reveal that the upcoming flagship will come with an in-display fingerprint scanner. Things get interesting when you flip the phone over. The Huawei P30 Pro is tipped to be the first smartphone from the brand to flaunt a quad-camera module and we can see the same in concept renders. However, unlike the recent Mate 20 Series, the P30 Pro seems to be retaining the vertical camera alignment from its predecessor, P20 Pro (review). We can see a black oblong structure housing three cameras and one standalone camera, accompanied by dual LED flash. If the previous leaks are to be believed, the fourth sensor on the phone will be a ToF (Time of Flight) camera that will be used for 3D face scanning and body shaping. Other rumoured features of the P30 Pro include telephoto lens with support for 10x optical zoom, 38-megapixel Sony IMX607 primary sensor, Kirin 980 octa-core 7nm chipset and Android Pie-based EMUI 9.0. The P30 series smartphones are expected to be released worldwide in March following their unveiling at the MWC 2019, which will be held from 25th to 28th of February.